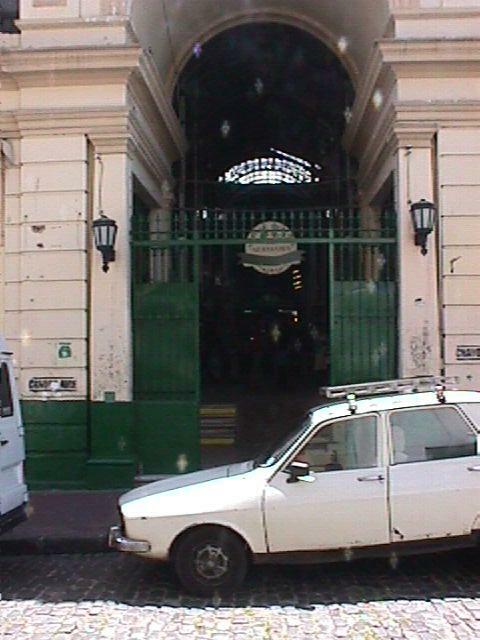 This outstanding San Telmo Market was built back in 1897 by the famous architect Juan Antonio Buschiazzo. Combining a typically modern Italian fa¿ade with a more English styled inside made in iron and glass, the San Telmo Market place is not only a tourist sight and trade mark -this is the last monument of it's kind... but an ode to our past and traditions there are no further market buildings currently working as products markets in the city. The architectural technique chosen by this fabulous architect for the San Telmo market combines the hygienist proposal -so famous back then- with the advantages of modernism and it's new material inputs. It can be appreciated from the inside of the market that the main concept that guided the construction was sanitation and hygiene, there are no inside walls, instead, a strong and gorgeous iron structure blended with glass creates a spacey environment. The outside fa¿ade's main focus it's a huge arch at the entrance -which exhibits a true Tuscany style at the arched main door benefiting from the building's highest point. This design is projected inside the building, through the various iron arches, transformed and methamorphed into a spacey multifunctional interior. San Telmo Vegtable & Antiques Market Place, Image Gallery. 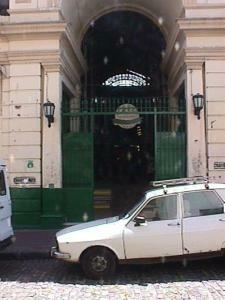 This outstanding San Telmo market was built back in 1897 by the famous architect Juan Antonio Buschiazzo. Combining a typically modern Italian façade with a more Enghlish styled inside made in iron and glass, the San Telmo Market place is not only a tourist sight and trade mark –this is the last monument of it’s kind… but an ode to our past and traditions there are no further market buildings currently working as products markets in the city. With a traditional eclectic feel typical from Buenos Aires the San Telmo market is a worldwide known tourist attraction for it’s architecture as well as antique market. However the greatness of this Market is that within it’s walls one gets one of a kind vintage items at the same time we can shop our daily groceries and stop for a quick lunch at the fabulous North-west Argentinean-Bolivian bistro… a glass of wine and their fantastic potato omelet is a must! Located at the intersection of Carlos Calvo and Bolivar St. the Market opens Tuesday thru Sundays from 10 am to 7 pm.Email Bob Frassinetti. The Buenos Aires Art Dealer,Argentina. Bob Frassinetti. Copyright 2005. Roberto Dario Frassinetti. Without a doubt we could mark with cross this location as the heart of one of Buenos Aires oldest and most interesting quarters christened after a very famous and beloved priest Saint Peter Gonzalez Telmo. The historic Buenos Aires and San Telmo neighborhood is very small, limiting to the following streets and avenues Chile, Piedras, Caseros , Defensa, Martin Garcia, Paseo Colon, Brasil and Ing. Huergo. Coffee is a fleeting moment and a fragrance. from the pocket of the coat and a pencil and started to write. The combination of those influences together with the very sense of Argentines and portenos created a particular cafe culture that's typical of our capital city. Visitors from around the globe when visiting Buenos Aires usually delight themselves with great food, but the last place they think that might raise some eyebrows is a cafe, but it happens. After the perfect grilled Argentine steak, the most delicious pasta dish and superb ice cream, the culinary surprises brought by the argentine palate might seem covered. But you haven't tried Buenos Aires flavour until you enjoy an espresso and a tostado. The consistency and rich flavor beheld in the small cup complements perfectly crispy thin bread layers mixed with just a perfect slice of ham and cheese. Within its simplicity this true Argentine combo is a treat to the senses. So if you are interested in Art or Antiques, and you are thinking of travelling to Argentina Chile or Uruguay please feel free to email me…….. Please feel free to contact Bob Frassinetti: For more information: Email: Bob Frassinetti. Press here to see all topics on Art, Antiques and Travel Information for Buenos Aires & Argentina:Everything on Art, Antiques, Collectibles as well as travel information for Buenos Aires, Argentina, Chile and Uruguay. Phone me thru Skype, ID: Bob_Frassinetti or you can also chat with me thru Yahoo, press here: Yahoo Contact Find me on MySpace and be my friend! Or Phone: +54 911 4475 3983 or in B's A's: 15 4475 3983 ) Invest in Argentina Real Estate an uprunning opportunity with a Future Read The Buenos Aires Art Dealer a e-zine magazine on Art, Antiques & Collectibles from Argentina. The Buenos Aires ArtDealer, Argentina. Everything along Defensa Street, starting from Hipolito Irigoyen and the May Plaza, May Square, the heart o Buenos Aires, Everything along Defensa Street, one of the most visited and well known streets of the Historical art and antique area of the City of Buenos Aires, Starting out from the May Square, la Plaza de Mayo, and the heart of this fabulous and romantic, vibrant City. We are to being our walk with our back to the Plaza and the central monumental there the Pyramid a homage to the May Revolution. The 25 of May of 1810. 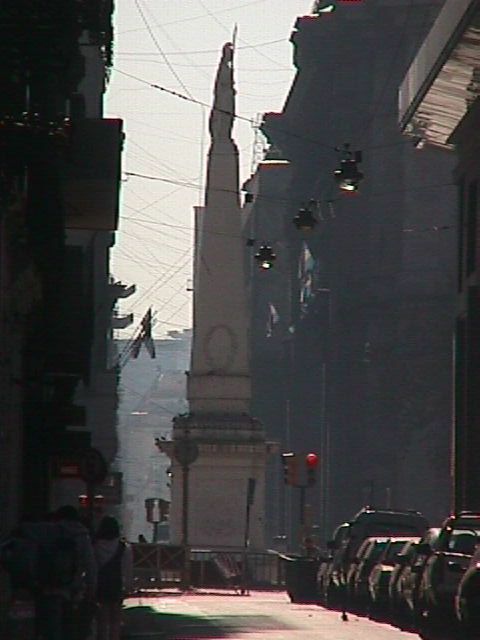 Plaza de Mayo and the Pyramid in its centre: Argentine lifetime Scenario ……….For more information: Email: admin@frassinetti.com Bob Frassinetti. Press here to go back to web blog:Daily Updates on Art, Antiques, Collectibles as well as travel information for Buenos Aires, Argentina. Phone me thru Skype, ID: Bob Frassinetti or you can also chat with me thru Yahoo, press here: Yahoo Contact Find me on MySpace and be my friend! . Plaza de Mayo and the Pyramid in its center as we know it today are the representation of Independent Argentina. The original plaza was the Plaza Mayor of the Colony but along with the Revolution of Independence came a new denomination for public spaces: it became Victory Plaza when Buenos Ares defeated the English invaders and after the Revolution of Independence. It was then, also, when the Pyramid was constructed. It was conceived as an Obelisk that would be the center point of the city, however, it transformed into a pyramid in 1856 by Prilidiano Pueyrredon. For more information: Email: admin@frassinetti.com Bob Frassinetti. Press here to go back to web blog:Daily Updates on Art, Antiques, Collectibles as well as travel information for Buenos Aires, Argentina. Phone me thru Skype, ID: Bob Frassinetti or you can also chat with me thru Yahoo, press here: Yahoo Contact Find me on MySpace and be my friend! Need an apartment along Defensa Street in between San Telmo and Plaza de Mayo, the heart of Buenos Aires, Press Here. And so if you are interested in Art, Design or Antiques, and you are travelling to Buenos Aires, Argentina, or to Santiago, Chile or even Montevideo, Uruguay and need to buy and export these items or only need tips and travel information, please feel free to email us…….Please feel free to contact Bob Frassinetti with thsi email address: Email: Bob Frassinetti. Located at the intersection of Defensa Sreet and Alsina Sreet is this monument to the first order of Minor Frails that established in Buenos Aires, back in 1583, Juan de Garay the city founder, awarded the Franciscan order with the whole block in which today is located the Basilica. The first church of the Franciscans in Buenos Aires began its constructions during the early 16th century, however the church did not take its current shape until 1731, when a Jesuit architect Andres Blanqui and the Sevilla Fray Vicente Muñoz took in their hands the project, which was inaugurated on March 25th 1754. The extremely humid weather of Buenos Aires and the use of perennial materials were some of the reasons to the collapse of its façade in 1807. It would be reconstructed by Tomas Toribio in the years to come. The current aesthetic of the church did not take final shape until 1911, when the German Architect Sackman altered its neoclassical style inspired by the Bavarian baroque technique. The main façade features a very elaborate work alike the towers, atrium and dome. The construction of the church features a single very long structure with small chapels to the side. The main altar is the only one that remains original from the 17th century, for all the others were made in 1911, and some of them had to be replaced after a huge fire that took place in June 1955. But the truly breathtaking aspect of this church is the outstanding front, mixing secular and religious figures in a one of a kind pantheon like sculpture: St Francis of Asis, Giotto, Dante Alighieri, and Christopher Columbus. One other amazing feature of this impressive basilica is the St Roque Chapel. Every 16th of the month, the chapel is opened to the public, for this is his holly day. Inside the beauty is outstanding and the craftsmanship of the imaginary brilliant, the highlight: the polychrome wooden images of the 18th century. See Image Gallery for Saint Francis of Assisi is one of the most beloved catholic saints of all times. And there are several reasons for this to be this way that one can discover when reading about this holly man’s life and doings. Born with all a man could need for a peaceful and tranquil life, he chose his faith over his wealth; he chose those in needs and in pain over his selfish needs. He devoted his time and energy to all God’s creations, not just men but also animals, plants, etc. That’s why frequently images, carvings and statues evoking St Francis feature not only his figure dressed in the brown rustic tunic with a rope on the waist but also birds and wild animals surrounding him. According to his biographers he had a special sensitivity to perceive God’s essence in each and every one of his creations; hence, resisting the body’s impact and listening to his soul, St Francis approached each and every one of God’s creatures with such kindness and purity of heart that not even wild wolfs attacked him. For more information: Email: Bob Frassinetti. Press here to go back to web blog:Daily Updates on Art, Antiques, Collectibles as well as travel information for Buenos Aires, Argentina. That’s why frequently images, carvings and statues evoking St Francis feature not only his figure dressed in the brown rustic tunic with a rope on the waist but also birds and wild animals surrounding him. For more information :Email Bob Frassinetti. Press here to go to The Buenos Aires Art Dealer, a webzine magazine on Art, Antiques & Collectibles made or found in Argentina. The Buenos Aires Art Dealer,Argentina. Bob Frassinetti. Copyright 2005. Roberto Dario Frassinetti. 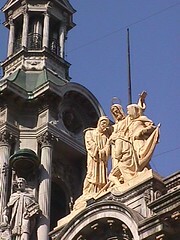 The Church of Saint Francis in Historic Buenos Aires, down town. It is known around the globe that Argentina is a very political country. In the country of the broad pampas, the great wine and the sensual tango dance, everyone has a saying regarding politics and you will see Argentines heatedly arguing about politics almost everywhere, from a city park to a cab, a downtown café or a social club. This society takes very seriously its deliberation role in the Republican organization of the Nation. And as such the individuals that altogether compose the society take part in politically significant actions thru means of public demonstrations. The center-point for these demonstrations has always been the political trademark space of the Nation: Plaza de Mayo, home to the governmental palace known as the Pink house. See Video Clip: Press Here. For over two centuries, two blocks conforming up the famous Plaza de Mayo have been the stage upon which most crucial decisive facts take place staging the turning points of the country’s history. Experts in politics and sociology agree on the central role this particular stage plays in the political evolution of the country. It is not that the people gathered in the plaza are the decision makers of our politics, but it is indeed true that no important decisions were made without the public support of the People demonstrating in the Plaza. Hence the phrase “A ruler who does not rule upon the plaza cannot govern the country”, meaning that the public opinion expressed on the Plaza de Mayo on his favor or against the government’s precepts, is key to furthering any governmental decisions. This tradition dates from the early days of the independence back in 1800. In May 1810, when the inhabitants of the Viceroyalty of the River Plate were discussing their independence from the Spanish Crown, distinguished Creole citizens gathered together in the place where today stands the Plaza de Mayo –back then known as the Plaza de la Victoria- to demand their Independence in front of the Cabildo (the governmental offices of the Colony). History text books tell that they demonstrated their will for independence under a strong rain, standing by the Cabildo in aims to pressure the authorities who were deliberating for several days. Once the decision was made the representatives communicated it to the awaiting crowd who celebrated with cheers and victory tears, and soon after the crowd took over the fort across the Cabildo. This fort was later on demolished and in that place a new building was constructed: the Pink House of Government. In 1884, the Plaza de la Victoria becomes Plaza de Mayo in honor of the May Revolution of Independence. The Plaza de Mayo, with its new name, would become the center for the Argentine political life. Back in 1890, the first modern political party was created under the name Civic Union, and to honor its creation the party organized its first political rally marching towards the Plaza de Mayo. That enormous gathering of people became a significant social event as it marks the first political act of masses of the contemporary Argentine History. The impact of the meeting was of such importance that it destabilized the corrupt government of President Juarez Celman forcing him to resign and call upon national elections. By the 1930s the Plaza de Mayo was already a trademark spot in the country, the heart of the political and social masses that chose this particular location to speak their mind. On September 8th the first dictator of modern Argentina Jose Felix Uriburu arrives to the presidency after overthrowing UCR party president Hipolito Yrigoyen with a military coupe d’etat. The fact that this political move had a strong support in the upper and middle classes of Buenos Aires was evident in its first public appearance, when President Uriburu decides to take the presidential sworn in the balcony of the Pink house facing a packed plaza de Mayo. This act is known as the appropriation of the public space by the ruling classes. However it won’t be long until the masses of working humble origin take upon the public space. On October 17th 1945, millions of workers from all around the country gathered together at the Plaza de Mayo to ask for the liberation of a populist Cornel that would soon become a massive public figure: Juan Domingo Peron. This was a turning point in the argentine history and the way the people did politics. It was a moment in which tables changed and actions awarded new meanings to public spaces. From then on, the Plaza de Mayo would no longer act as a ruling class public space, but more of a popular lower class tribune thru which the “dispossessed”, as Peron used to call them, spoke up their mind. A couple of years latter the famous scene from the Evita Musical took place. A packed Plaza de Mayo with Peronist followers was cheering for Evita whom they wanted to be vice president for the reelection of the General Juan Domingo. Evita was very ill, being eaten up by a deadly cancer; she addressed the masses, asking them not to cry for her… soon after the woman who had awarded the Female Argentines their right to vote passed away. After being reelected for a second term in 1952 Peron governed Argentina for three more years before he was overturned by the National Navy and Air Forces. The overturn took place during a terrible bombing. The place bombed was the famous Plaza de Mayo. Peron was forced to a long 18 year long exile and the traditional public political activity was tried to keep silenced. The political movement relocated from the plaza de Mayo to other public spaces to express its ideas and ideals. The masses would regain the Plaza in 1974, during the demonstrations of May 1st when the Peronist leader was reestablished as the Nation’s president. Soon after the forces of the Military leaders would retake upon the democratic government opening a dark period in the Argentine history. Marshal Law was established together with a myriad of human rights violations. The only courageous ones enough to protest were the relatives and mothers of the abducted civilians. On April 30th 1977, the organization Madres de Plaza de Mayo regained control of the Plaza to demand the appearance with life of their children and grand children. During the early 1980s a big demonstration of Unions and Syndicates takes upon the Plaza de Mayo to demand the end of the Military government. But the demand was darkened by the declaration of the Falkland Island war on April 2nd 1982. The war was a failure and it aided in the ending of the dictatorship. On December 10th 1983 the Argentine people would regain control of the Plaza de Mayo as they celebrated the elections of the new democratic president Raul Alfonsin. Once again the Plaza de Mayo belonged to the people, who made their voice to be heard to those in power. From then on, the Plaza de Mayo regained its social and political meaning being the center point for all sorts of public and cultural demonstrations. In 1986, when the Argentine Soccer team won the Mexico World cup, the Plaza de Mayo was the chosen stage for the celebrations that took place. In the years to come the plaza would still be the selected scenario for the people of the Nation to express and speak up their minds. The most recent event in this line of action were the demonstrations and protests of December 19th and 20th back in 2001, when millions of Argentines gathered together to express their discontent with the economical and social policies the government of Fernando De La Rua was furthering against the interests of the majority of the citizens. The result was De La Rua’s resignation and the opening of a broad economical and political crisis that only in recent years has become to a closure to open an era of growth and development. See Video Clip of a live demonstration in Plaza de Mayo marking the 30 anniversary of the Military Golpe de Estado of 1974. PRESS HERE: Filmed with my Sony Ericsson P990i, on 24 March 2007 by Bob Frassinetti. It’s a long video so it might take some time to down load.